Americans are slouches when it comes to walking. According to a recent survey of 1,224 adults commissioned by Kaiser Permanente, a third of Americans reported they do not walk for more than a 10-minute period during the course of a typical week. Of the remaining two-thirds, another 31 percent said they get less than the CDC’s recommended weekly 150 minutes of walking. The results of the survey were released at the Walking Summit last week in Washington. Americans aren’t ignorant about the health benefits of walking. 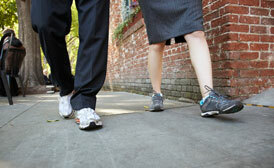 Seventy-four percent said they should walk more. Eighty percent know walking reduces depression, and more than that acknowledge it reduces anxiety and can prevent heart disease. So what’s holding us back? Lack of time and energy were cited as major reasons for not walking enough, according to GFK Research, the company Kaiser hired to produce the report. Another big factor was neighborhood conditions and the way we’ve built our society around driving to the exclusion of healthy, active transportation. Four in 10 of those surveyed said their neighborhood was “not very” or “not at all” walkable. The biggest deterrents included “lack of sidewalks, drivers who speed and drivers who talk on their phones or text.” Crime was the eighth most frequently listed factor, and was ranked higher by black and Hispanic respondents. The survey also found that, for the most part, Americans do not choose their neighborhoods based on walkability. (Although recent research from the National Association of Realtors indicates otherwise.) Those who lived in walkable neighborhoods, however, reported logging more steps every week. Maybe if more Americans were less afraid of people who didn’t look like them and opted to not choose sprawled cul de sacs and gated communities they wouldn’t be reaping what they have sown……the gee I wonder why my behind is 3 sizes too big and I and my children need diabetes medicine in this awesome autocentric 3-car garage vinvyl side hell-hole I convinced myself I needed syndrome. We have walkable communities we built them in the past just look at any pre-war city for Christ sake; move there improve your life, your health, cut back your car and improve the economy too boot. That’s quite the leap. I mean, you could have a walkable neighborhood in a monochromatic land of suburban cul-de-sacs if you wanted one. I think the problem is more that people in general are inherently lazy. Americans built non-walkable neighborhoods because they didn’t want to walk. My neighborhood is very walkable. However, some houses have sidewalks that are in poor condition, to the point of being hazardous. Also, some homeowners do not shovel their sidewalks in winter. I walk pretty much every day. In winter, it’s often safer for me to ride my bike, as the streets may be cleaner and have less snow and ice than the sidewalks. I think people bought cars to avoid walking, then realized it meant they could afford a bigger home further away. Then they screamed for wider streets so they would be caught it traffic, and then bought homes on cul-de-sacs to keep other cars from charging past their homes. Then when they realized they kind of missed walking, they realized they can’t walk from home, so they drive to a shopping or entertainment district that has big parking on the fringe and a psuedo-city center in the middle so they can pretend they live in a walkable city. No. You cannot. As the illusion that is New Urbanism illustrates all to well. In my neighborhood, what prevents me from walking is psychotic drivers who see me as an obstacle to maneuver around at high speed instead of a human being with a right to get to where they want to be. This behavior results in cars speeding around me when I am crossing at an intersection with a walk signal. Why would I walk if I feel like I am going to get killed? Sad, sad state of affairs. There’s also the matter of where the jobs are. We live in a reasonably walkable urban neighborhood, with access to (by U.S. standards) adequate transit to get to a workplace in the city. Great–if there are, in fact, workplaces in the city. But the new reality is that of the few jobs that still exist, nearly all are in suburbs reachable only by car, mostly in one of those “not very” or “not at all” walkable locations. And by the time you’ve spent your two hours a day driving there and back, there’s not much time left to enjoy your own neighborhood.